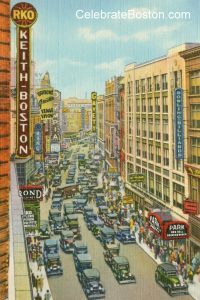 On December 16, 1942, a third disastrous fire took place in Boston during a brief time span. In November, 1942, nearly 500 people were killed at the Cocoanut Grove Nightclub, and six firemen were killed at the Luongo's Fire. It was the worse month in Boston's history in terms of loss of life by fire, with colonial Smallpox Epidemics and the 1918 Pandemic the only comparable disasters. The fire began in the basement of Sallinger's Department Store at Washington and West Streets. The fire spread quickly through elevator shafts and stairwells to small stores and offices in the upper stories. Sallinger's specialized in women's clothing and furs, and the total financial loss caused by the fire was up to one million dollars, a huge sum at the time. The fire sent about 65 people to the hospital, many of whom were Coast Guard men that helped fight the fire. Due to the wartime draft and shortage of fire fighters, it is lucky the blaze did not spread to adjacent buildings in the congested downtown shopping district. Sallinger's was located at the five-story Amory building that fronted Washington Street, and the fire quickly spread to the Blake building on West Street. A two-inch gas line in Sallinger's basement could not be shut off by the gas company, and the pipe had to be left alone for several hours spewing flames and toxic fumes into the building. The fire department's $18,000 aerial ladder was destroyed by a collapsed wall during the Luongo's Fire, and much of the blaze had to be fought using exterior ladders. A state-wide blackout to protect against a German air raid had been lifted only a few hours before the fire, and it was reported that the area was quite dark when fire apparatus first arrived. Washington Street was choked with parked vehicles due to the Christmas shopping season, which also impeded the fire fighting effort. Five alarms were called, and about 600 fire fighters were dispatched to the scene, representing nearly half of the department's staff. A contingent of 160 Coast Guard men were deployed to support the effort. About 25 of the injured were from the Coast Guard, who helped string ice-coated water lines through the snow and into the buildings. So much water was poured onto the blaze, that the subway below Washington Street began to flood, and pumps were employed to keep the transit line open. Sallinger's, a shoe store, and a jewelry store were damaged the most. The streets were cleared of thousands of spectators, and a security force was set up as firemen went into the jewelry store and retrieved precious stones and jewelry from interior vaults. It is very lucky that the unhindered gas line did not build up gases in rooms and cause an explosion. Reports stated that firemen were on the lower stories, and fire literally broke out above their heads in the ceilings from the floors above. The fire took about five hours to get under control, and about ten hours to extinguish. It is very fortunate no one was killed in this fire, as compared to the tremendous loss of life at the Cocoanut Grove and fire fighters at Luongo's. The entire business district could have been lost if not for the brave effort of the fire fighters, and help from members of the Coast Guard.